Even if you just have one or two people replying on social media, signatures are a great way to make your customers' experience that much more personal. It's much nicer for someone to know that a real person is reading and responding to their messages, and including your name or initials helps to reinforce a sense of continuity of care. 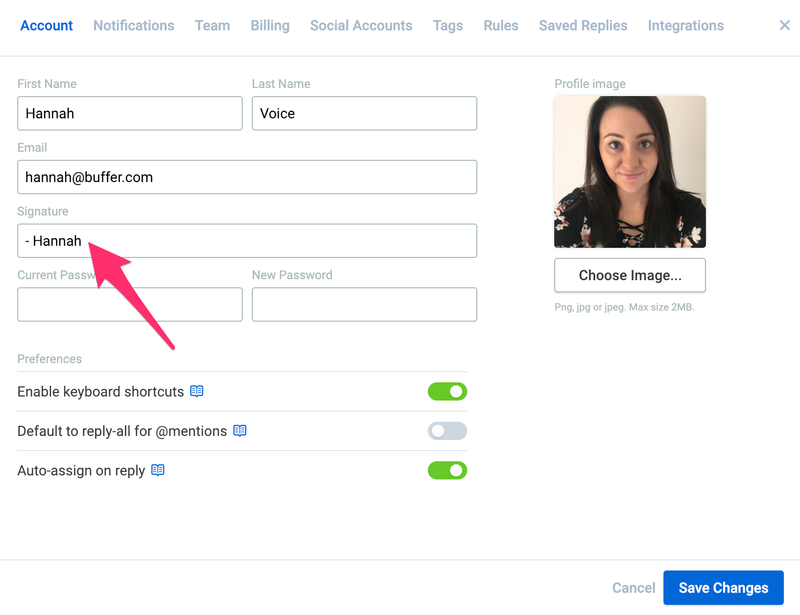 Additionally, this allows customers to identify who they've previously chatted with, which can be helpful should they need to move the conversation to another channel. To add your signature, click on Settings on the left hand side of your dashboard and then select the Account tab. Add your signature within the Signature field and then click Save Changes. Not sure what to use for a signature? Common conventions include appending first names (-Hannah) or initials (^HV). Once added, all outgoing replies will be appended with your signature.